The munter hitch, when used in conjunction with a pear-shaped locking carabiner, is used to form a mechanical belay. STEP 1. Hold the rope in both hands, palms down about 12 inches apart. STEP 2. With the right hand, form a loop away from the body toward the left hand. Hold the loop with the left hand. STEP 3. With the right hand, place the rope that comes from the bottom of the loop over the top of the loop. STEP 4. Place the bight that has just been formed around the rope into the pear shaped carabiner. Lock the locking mechanism. 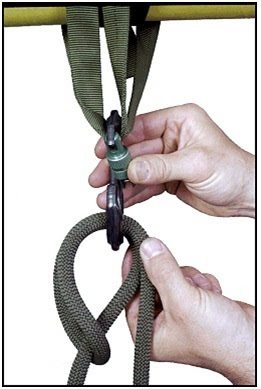 (1) A bight passes through the carabiner, with the closed end around the standing or running part of the rope. (2) The carabiner is locked. The rappel seat is an improvised seat rappel harness made of rope. It usually requires a sling rope 14 feet or longer. STEP 1. Find the middle of the sling rope and make a bight. STEP 2. Decide which hand will be used as the brake hand and place the bight on the opposite hip. STEP 3. Reach around behind and grab a single strand of rope. 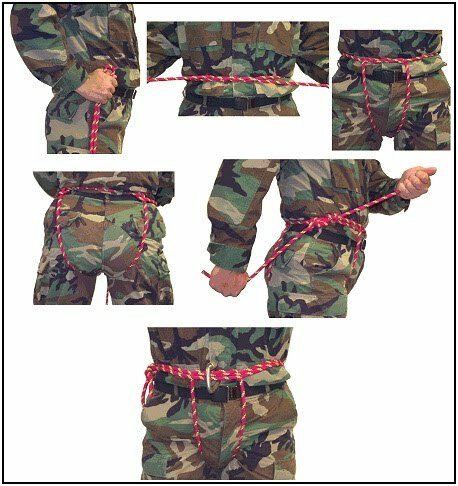 Bring it around the waist to the front and tie two overhands on the other strand of rope, thus creating a loop around the waist. STEP 4. Pass the two ends between the legs, ensuring they do not cross. STEP 5. Pass the two ends up under the loop around the waist, bisecting the pocket flaps on the trousers. Pull up on the ropes, tightening the seat. STEP 6. From rear to front, pass the two ends through the leg loops creating a half hitch on both hips. STEP 7. 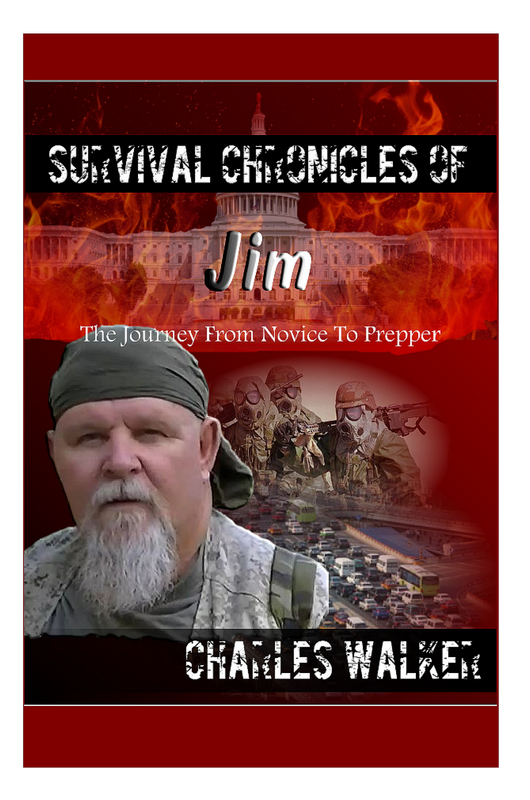 Bring the longer of the two ends across the front to the nonbrake hand hip and secure the two ends with a square knot safetied with overhand knots. Tuck any excess rope in the pocket below the square knot. 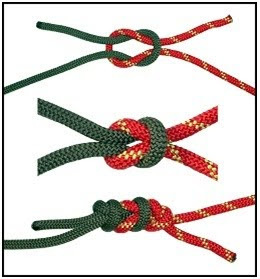 The square knot is used to tie the ends of two ropes of equal diameter. It is a joining knot.